LG stands at the top by presenting the world's first curved 55-inch OLED TV. Delivers you with better color accuracy and vibrancy. 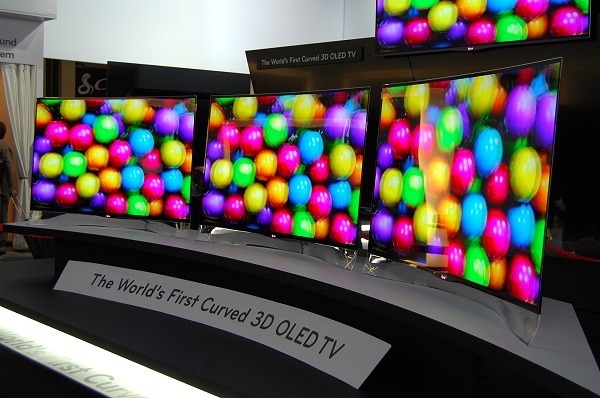 LG presents the next evolution of this technology and decided to start their OLED TVs delivery by March 2013. The EA9800 is sleekly designed up with a 55-inch and 4mm thickness. Currently the OLED panels are quite poor but LG mentioned that their WRGB quad-core pixel structure delivers better vibrancy and color accuracy. The smooth inward curving design ensures that angle of curvature does not distract your great viewing experience and helps in reducing screen edge distortion loss aspects with a traditional large screen flat panel display. Enjoy smooth screen of EA9800 disclosed at CES 2013. This can be gently back to about 5 degrees, which ensures the TV view at the most optimal angle with at least amount of strain. The most notable thing is its slope which is TVs overall design frame and skin to sheet of paper which is very lightly curved. The EA9800 is featured with Cinema 3D capability. Now, redesign your TV room by placing the new curved TV on a low height which will bring a stunning difference with clearer and broader viewing experience.